Morris League will be playing baseball June 2014, for its 3rd Morris League Summer Series Season. Sign Up below. 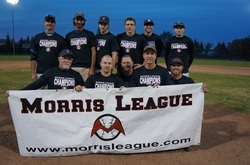 Chico Sabres won the 2013 fall Morris League Season.